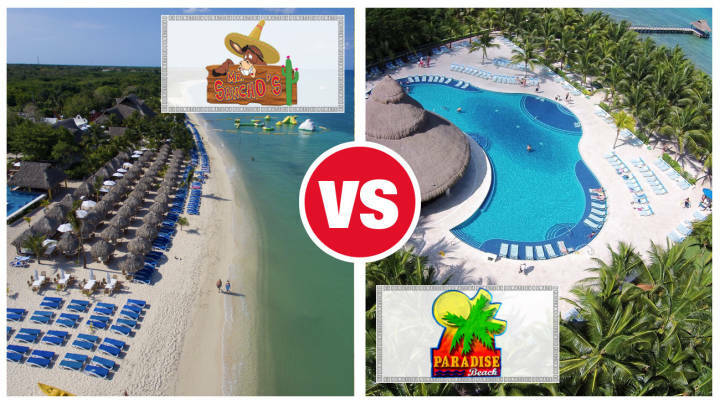 Cozumel passengers alway ask , “Paradise Beach vs Mr Sanchos”… which resort should I visit? If you’re looking for an “all inclusive” option, then it’s an easy answer. You’ll want Mr Sanchos. If you prefer to “pay as you go,” however, it’s a tougher decision. Below you’ll find all of the info you’ll need to settle the age-old competition between Paradise Beach vs Mr Sanchos. Before we get into the rules of engagement and start this melee, we’ll need to first put all the cards on the table. While these are two of the most popular options, you have seven other great choices for your day at port. For details, see our full list of 9 All Inclusive Day Pass Options in Cozumel. There’s a resort option for everyone, whether you’re a foodie, adventure seeker, or you’re looking to tie on a serious buzz. If you’ve checked out the other options and you’ve narrowed it down to Paradise Beach vs Mr Sanchos, then we’re here to help. Below you’ll find an infographic showing the two resorts along with a number of different characteristics we’ve found most important to visitors. In the image, we’re comparing the “pay as you go” option to Mr Sanchos, as opposed to an All Inclusive Pass. From the analysis above you can see that there’s no obvious winner. Mr Sanchos is free and has a cheaper water park, but has a slightly higher taxi cost and you’ll spend significantly more if hoping to rent some water-sports gear. We’ll break down each component in the list below. You’ll find answers to some of the most frequently asked questions here as well. We’ve had reports of Paradise Beach getting crowded. It’s not certain whether they have a daily capacity and if they cut off access once that’s reached. Mr Sanchos, however, has a stated capacity of 450 guests per day. Once this limit is reached, they’ll deny entrance. That could be a real bummer if taking a taxi all the way to the property. To assure a spot, you can reserve the All Inclusive option. This will lock you in for a great day in Cozumel and eliminate all risk of either park hitting capacity. With the provider below, you’re also able to cancel any time before 11 days prior, so there’s no risk. Of the two, only Mr Sanchos provides an All Inclusive option. On their website, you’ll see this listed for $55. Using our link above, you’ll find this for $49.95. This will include all of the most important items you’d need for a great beach day. Namely, food, drinks (including alcohol), beach, and beach amenities. You’ll have comfortable chairs, umbrellas, hammocks and more to get some sun or lounge in the shade. For the “pay as you go” option, Mr Sanchos is free to access. They’ll ask that you spend at least $10 at the bar or restaurant, which is easy to do with a couple drinks. But, there is no entrance fee. Please note, however, that guests will be turned away if the daily capacity is reached and you don’t have an all inclusive pass purchased. Paradise Beach has a $3 entrance fee for guests. That will get you access to the beach, chairs, umbrellas, and ability to purchase the offered upgrades (see below). Mr Sanchos all Inclusive cost for kids is $35. For the “pay as you go” option, entrance is free for children. Paradise Beach charges a $3 entrance fee for kids. This will get access to the beach, pools, and more. This is an easy round going to Paradise Beach. The resort opens at 9:00 AM and closes at 6:00 PM. This is an hour later than its rival, which closes at 5:00 PM. Typically, cruise ships depart around this time, so you won’t need this extra hour. For the late departures, however, it could come in handy. Mr Sanchos is slightly further than Paradise Beach and will cost a couple more dollars each way. If you know your specific cruise port, you can find your exact cost in our Cozumel Taxi Rates post. There you’ll find taxi costs to all nearby attractions and also for our secret to saving 50% on your taxi rides while in Cozumel! Hopefully, “wifi” won’t be too much of a factor in your decision between Paradise Beach vs Mr Sanchos. But, we get it. You need to check on your virtual pet rock, peep the Nest Cam, or read up on some calming political news. Both resorts offer free wifi, so you should have no problem connecting to the mainland. Neither resort go out of their way to provide child-specific features. Of course there’s plenty to do for both the young and the old, but if looking for playgrounds or sock puppets, you won’t find these at either resort. Both have an aqua park, however, that kids will love. These cost extra as seen below. If a kids area is a “must have attraction,” then check out our other Cozumel resort options. Paradise Beach offers a water park as well. You’ll pay slightly more for access at $18 for a day pass. Here are some of the included features you’ll find there: water trampolines, 14-foot climbing iceberg, water slides, Jungle Joe climbing structures, Wibit Flipper, Aqua Glide Blast Bag, Rock-it water rocker, water mats, and more. If you’re like us, this is a mandatory item when picking your day pass. Unfortunately, Paradise Beach doesn’t offer a swim-up bar. Their pool is located just a few feet from a bar, but definitely not in swimming distance. Mr Sanchos has a delightful swim-up bar and one of Senor Sanchos many sons will be tending bar and eagerly awaiting your order. Ok, we made that part up. But, yes they do have this feature. Just be weary of the guy who never leaves his pool-stool. Surprisingly, neither resort offers snorkeling gear with your admission pass. Mr Sanchos provides equipment for rent for $20 per day. Even if you purchase the all-inclusive option or pay for access to their water park, snorkeling gear is not included and must be rented. Paradise Beach has a better deal. If you pay the $18 for access to water park, this includes snorkeling gear. Some cruisers bring their own snorkeling gear. We’ve heard three main reasons for this. One, to save money. Two, because they’re weirded out about sucking plastic that has touched hundreds of other mouths. And three, to have access to much better equipment. For example, these full-face snorkels on Amazon will cost you slightly more than the rental fee at these parks. If choosing the “pay as you go” option at Mr Sanchos, you’ll not have access to their water sports equipment. Kayaks, paddle boards, jet skis, etc will cost you anywhere from $10 to $72. If going “all inclusive” for $49.95, you’ll have access to kayaks, sailing equipment and windsurfing gear. Paradise Beach offers access to some equipment if you choose to pay the $18 per day add-on fee. This includes kayaks, paddle boards and more. Otherwise, no water sports equipment is included in your $3 access to the park. Mr Sanchos has a few bonus features that are included in your free entrance. You’ll have access to a beach volleyball court, hammocks, tiki huts, and a big jacuzzi. Paradise Beach offers few “extras” without paying the additional fee. You’ll have access to beach chairs, umbrellas, and some shaded area. Towels are not included with your visit to either resort. At Mr Sanchos you can rent a towel for $15 and get $10 back when you return it. So it’ll cost a total of $5 for the day as long as a manatee doesn’t swim off with your towel. Paradise Beach does not offer towels. You’ll need to bring one from your cruise ship. Just don’t leave it there! If you’re going for the “pay as you go” option, then cancellation isn’t an issue. If you decide to go All Inclusive at Mr Sanchos, you’ll have the ability to cancel at any time before 11 days prior for a full refund. So again, no risk to reserve a spot. Here’s the link again to lock in your all inclusive pass. Based on the info above, you can see that there are no wrong choices when deciding between Paradise Beach vs Mr Sanchos. Both are amazing options and almost a guaranteed great day in Cozumel. We hope that we made your choice easier. If you’d like to see other options, check out our full list of 9 Cozumel Resort Day Passes here.